A hat trick from Darren Campbell helped Harryville Homers win their fifth straight Rainey Cup with a 4-0 win over Carnlough Swifts. Homers almost got the perfect start when they attacked straight from the kick off through David McWhirter and his pace helped him set up Gary Bonnes but his shot was blocked. After this nervy start Carnlough started to settle into the game and had an appeal for a penalty turned down on 10 minutes when Brendan McDermott pounced on a spill from Alex McCosh, but the referee waved the appeal away. McCosh was then called on to keep the scores level when he dived low to save a header from Stephen Morgan as he rose highest to head a Sean Ward free kick goal ward. From the resulting corner kick Carnlough went close again through Andy Bird but his shot was blocked on the line by Marcus Spratt. Homers started to turn the screw just before the break and almost took a half time lead when Darren Campbell broke into the box but his shot was saved by Connor McNeill in the Carnlough goal as the half finished in stalemate. The second half was only six minutes gone when Homers struck the opener. Ryan Stewart drove down the left and drilled the ball across goal where the ball was diverted home by Darren Campbell. Carnlough looked dangerous on the break and went close on one of these breaks when Sean Ward controlled a brilliant long ball and clipped an effort just off the crossbar. Homers doubled their lead on 70 minutes when Darren Campbell wriggled free on the edge of the box and fired low into the corner of the net. It was 3-0 10 minutes later when a shot from Mark McKay was handled in the box by a Carnlough defender and the penalty was awarded. David Nicholl stepped up and fired into the corner of the net. 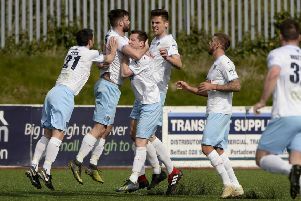 Two minutes later Homers clinched the win when Darren Campbell drilled home to complete his hat trick and seal Homers’ fifth trophy win of the season. After the final whistle BSML Chairman David King on behalf of sponsor Alex Rainey handed the Rainey Cup over to the winning Harryville Homers Captain Gary Bonnes and the celebrations began. Harryville Homers: Alex McCosh, Ian Russell, Ryan Stewart, Marcus Spratt, James Gracey, Alan Rainey, Jason Logan, Darren Campbell, Mark McKay, David McWhirter, Gary Bonnes. Subs: Richard Reid, Jasin Magill, Paul McNeill, David Nicholl and Richard Forsythe. Carnlough Swifts: Connor McNeill, Peter Black, Declan Diamond, Josh Quinn, Shane Mallon, Andy Bird, Kele McAuley, Steven Morgan, Brendan McDermott, Sean Ward, Michael Abram. Subs: Aaron Martin, Seamus Lee, Hugh Pat McNeill, Conal Ward and Henry Morgan. This Tuesday sees the finale of the BSML season with the inaugural Montgomery Cup Final taking place at Michelin. This Cup was introduced towards the end of the season to supplement the Division Three league campaign, and was played on a league basis with the two section winners meeting in the final. Section A was won by runaway winners Southside Rangers who had a 100% record in their group games. Southside have hit a rich vein of form in this competition scoring no fewer than 25 goals in their five games. Section B saw league runners up Atletico Antrim come to the fore as they progressed to the final with three wins and a draw, with their narrow 1-0 victory over Carniny Amateurs and Youth sealing their passage to the final. Both sides having already sealed promotion will be hoping to add a Cup win to their season, and with both league games going the way of Atletico Antrim, Southside will be hoping to seek some revenge, in what looks to be a cracking final.